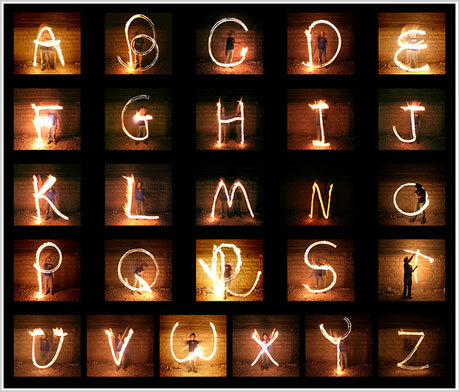 Fire-Poi Typography by Nir Tober. Everything that we speak of as Western civilization we could speak of as alphabetic civilization. 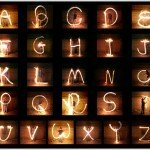 We are the culture of the alphabet, and the alphabet itself could be seen as a very potent form of magic. You know, we open up the newspaper in the morning and we focus our eyes on these little inert bits of ink on the page, and we immediately hear voices and we see visions and we experience conversations happening in other places and times. That is magic! It’s outrageous: as soon as we look at these printed letters on the page we see what they say. They speak to us. That is not so different from a Hopi elder stepping out of her pueblo and focusing her eyes on a stone and hearing the stone speak. Or a Lakota man stepping out and seeing a spider crawling up a tree and focusing his eyes on that spider and hearing himself addressed by that spider. We do just the same thing, but we do it with our own written marks on the page. We look at them, and they speak to us. It’s an intensely concentrated form of animism. But it’s animism nonetheless, as outrageous as a talking stone. In fact, it’s such an intense form of animism that it has effectively eclipsed all of the other forms of animistic participation in which we used to engage — with leaves, with stones, with winds. But it is still a form of magic. — David Abram as interviewed by Scott London on his National Public Radio series “Insight & Outlook” (c. 1999). Available in “The Ecology of Magic: An Interview with David Abram”. Posted on behalf of David Abram on Saturday, July 31st, 2010 under Quotations.